1. Heat half the butter in a saucepan. Add the onions and cook for 20 minutes until softened and dark golden. Stir in the flour and cook for 1 minute. Gradually stir in the stock then bring to the boil and simmer for 2–3 minutes until thickened. 2. Meanwhile, place the potatoes in a large saucepan and cover with cold water. Bring to the boil and cook for 15 minutes until tender. Drain well and return to the pan. Add the remaining butter, milk and Old Style mustard. Mash until smooth, then cover and set aside. 3. Heat the oil in a large sauté pan. Add the sausages and fry for 15 minutes, turning occasionally, until browned all over. Stir through the honey and Dijon mustard and cook for 1–2 minutes until sticky and cooked through. 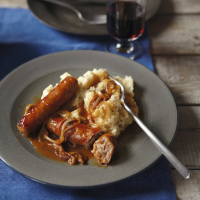 4.Serve the glazed sausages and mustard mash with the hot gravy spooned over the top.